Easy Valentine Day Gifts from Sweaters! Valentine’s Day is right around the corner, but it’s not too late to make personalized gifts for the loved ones in your life. These simple projects are made from sweaters I found at Goodwill. The easiest idea are wine bottle covers. Just cut off a sleeve to fit, sew up the bottom and embellish! No need for a card this year. The pink wine “cozie” sports a traditional VD greeting. 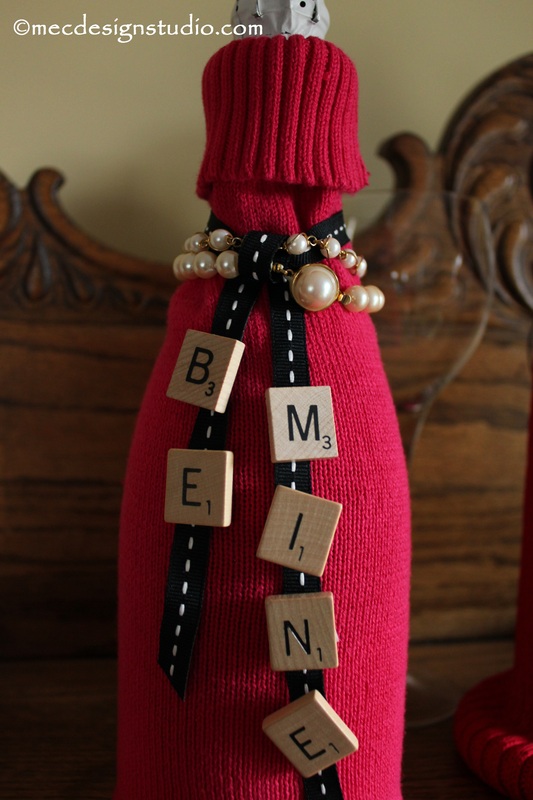 Glue Scrabble tiles to a sturdy ribbon and add a vintage pearl necklace (two gifts in one!). Or give someone special the key to your heart. 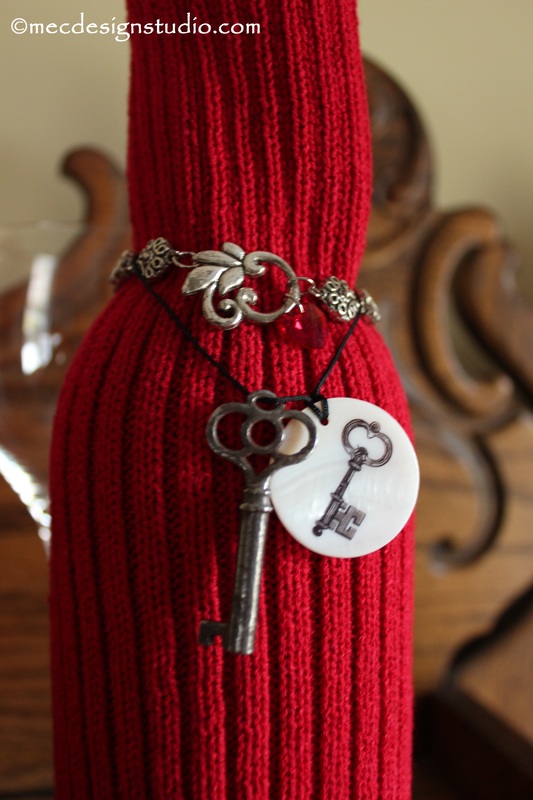 For this one, I tied on a leather “chain” with vintage key and added a bracelet. 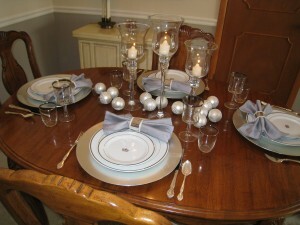 Personalize your gift with little charms or pieces of jewelry. Don’t forget Mom on Valentine’s Day. Every woman loves flowers. Send her a bouquet in a custom designed vase. 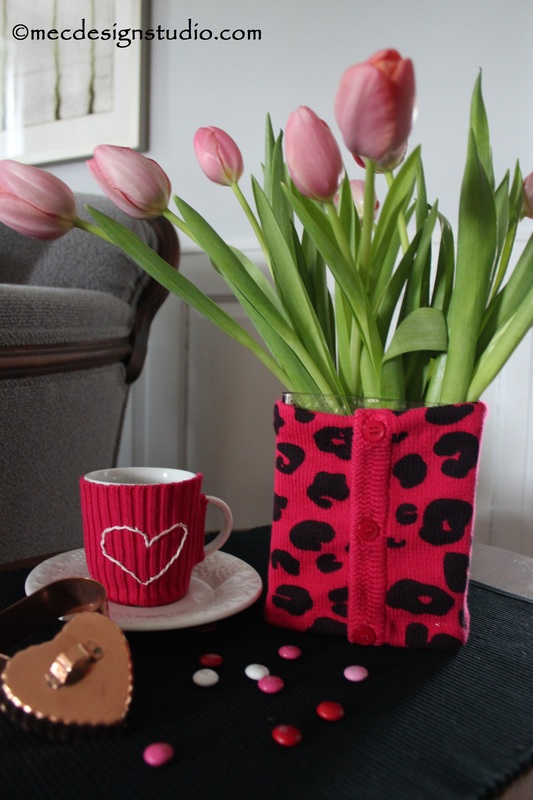 Using the front of an animal print sweater, I wrapped it around a rectangle shape jar (the perfect style for tulips). Hem the raw edges so it doesn’t ravel or if you don’t sew, use glue. If your Mom is anything like me, her coffee gets cold before she finishes a cup. 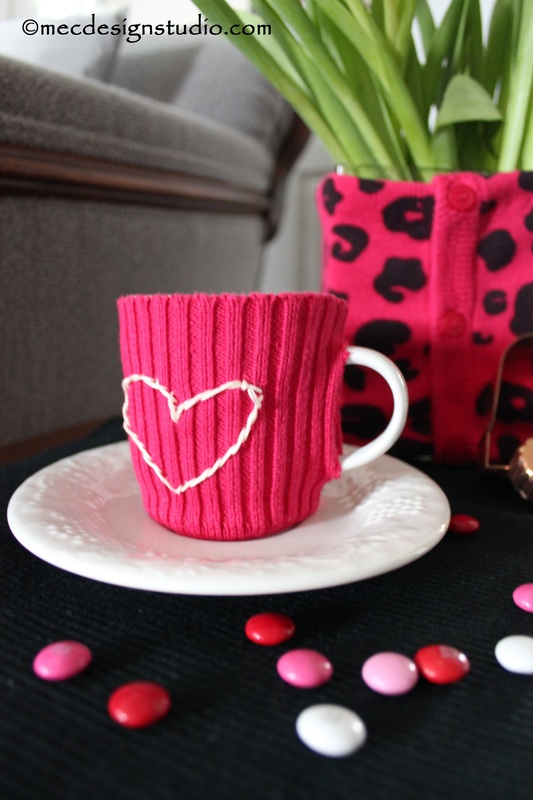 Keep her coffee warm with a mug cozie made from the cuff. Make sure you use the finished edge at the top. Then sew up the bottom with a running stitch and cut a slit on the side for the handle. I embroidered a simple heart, but you could add more charms or pins. 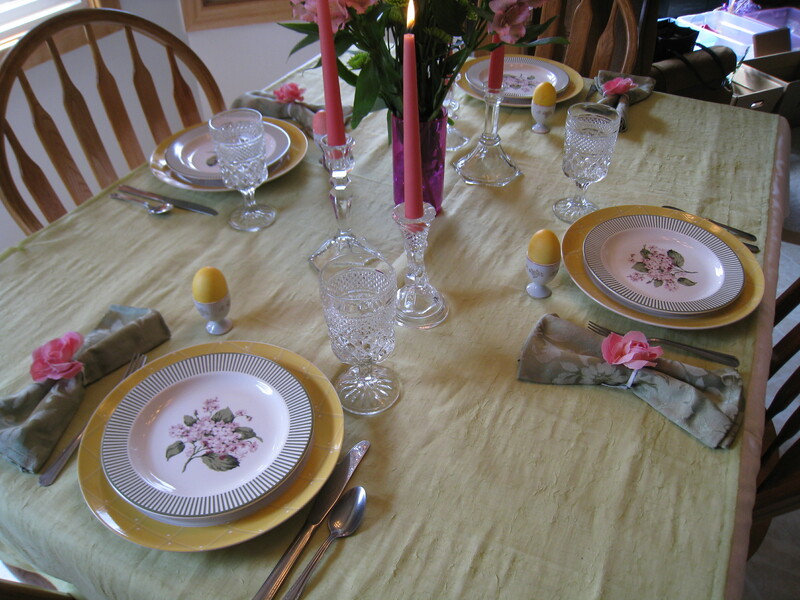 Something just for Mom. There is no end to the gifts you can make for the special people in your life from sweaters. 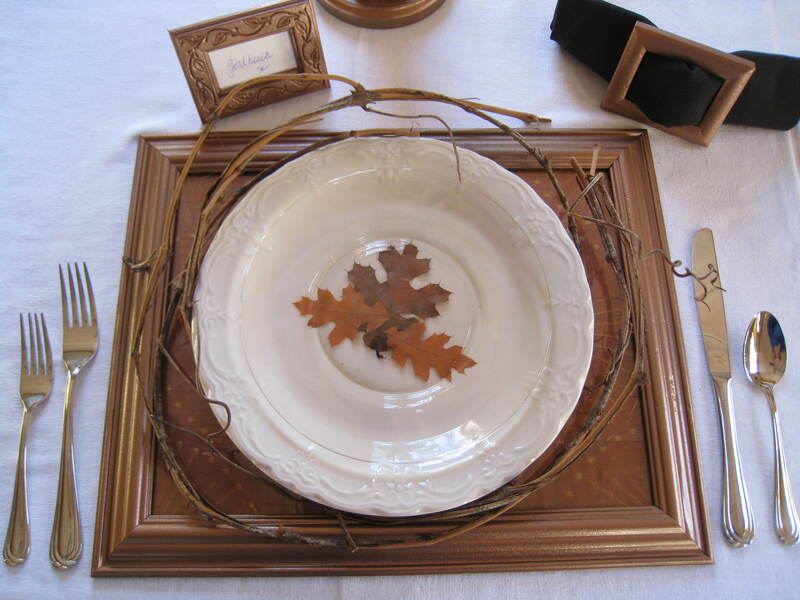 I would love to hear your DIY ideas for Valentine’s Day gift ideas. 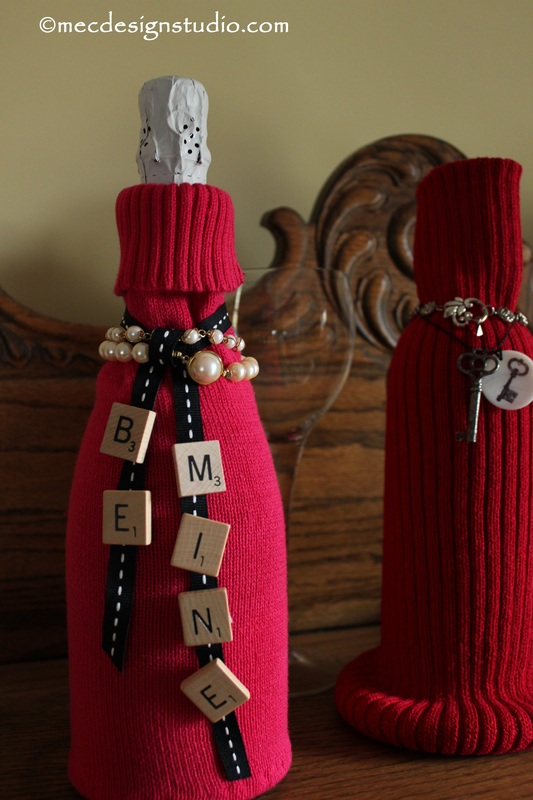 I love these ideas for repurposing old sweaters! I have been actually looking for something to do with a whole box of old sweaters and this is perfect. Perfect timing as well! That animal print vase cover is just too cute! This upcycling of sweaters never occurred to me. Thanks for sharing! Stopping by from SITS Comment Love. Very creative! I’m not much of a DIY person so I go out and buy gifts. I wish I was crafty. Happy Valentine’s Day! I love the sweater wrapped around the vase, what a fresh new take! Happy Valentine’s Day! I LOVE the coffee cozie. So cute, and I love my coffee. Visiting from SITS. Please visit me back, if you have not already. My link in the spreadsheet had an error. Eek! Hope you are having a great week! That mug cozy is adorable! Would be perfect for my tea. What a great way to up-cycle your old sweaters! Thanks for sharing! Love this, pinning for later.